Oakham School was delighted to welcome England netball player and Commonwealth Games gold medallist Jodie Gibson to help coach the U14 and U19 teams in their preparations for the forthcoming National Final competitions this weekend. Jodie was able to put the girls through their paces and pass on a few tips to improve their knowledge, tactics, skills and agility. Lower School girls were also given the opportunity to meet Jodie and see her Gold medal. They spent some time asking her questions from how long it took to become England standard, how does it feel to win in the Commonwealth Games, to what is her least favourite position on court! Jodie gave a very strong message about the importance of showing resilience in order to achieve goals, and working harder when knock-backs occur. She described how much life she has had to miss, including friends' weddings, for Netball - but that it was all worth it. 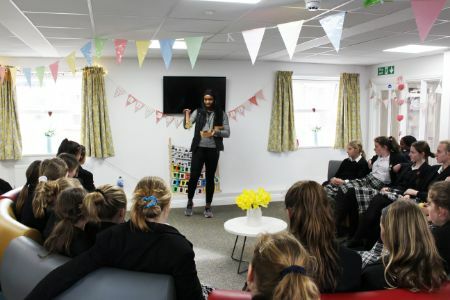 She concluded by telling the girls that: "you might have to miss out on things when you’re working hard, but the end result will feel so good that it makes it worth it - so keep the end result in mind." Oakham netballers are challenged throughout the season and are very lucky to have opportunities to train with such elite athletes. We wish the U14 and U19 teams the best of luck for the Finals.